Research chemist Edwin Newton Ohl (Harvard A.B. 1923, Ph.D., 1930) began to collect rare historical works in early science and chemistry after the end of World War II and gathered nearly 100 titles, from the 15th through the early 20th century, before his death in 1956. Notable scientists represented in the collection include Francis Bacon, Roger Bacon, Niels Bohr, Robert Boyle, René Descartes, Albert Einstein, Michael Faraday, Pierre Gassendi, Nicolas Lemery, Michael Maier, and William Salmon. 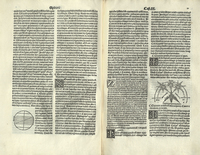 The rare books of the Ohl Collection, complemented by some alchemical manuscripts of Sir Isaac Newton, were presented to the Boston Medical Library by Mrs. Harriet Ohl and her children in 1975.